Sweet and Spicy Pecans | K.I.S.S. Try these Sweet and Spicy Pecans to add a little extra flavor to a salad or serve them with some cheese as an appetizer. They have just enough sweetness and spice. They are very simple to make and can be made ahead of time. 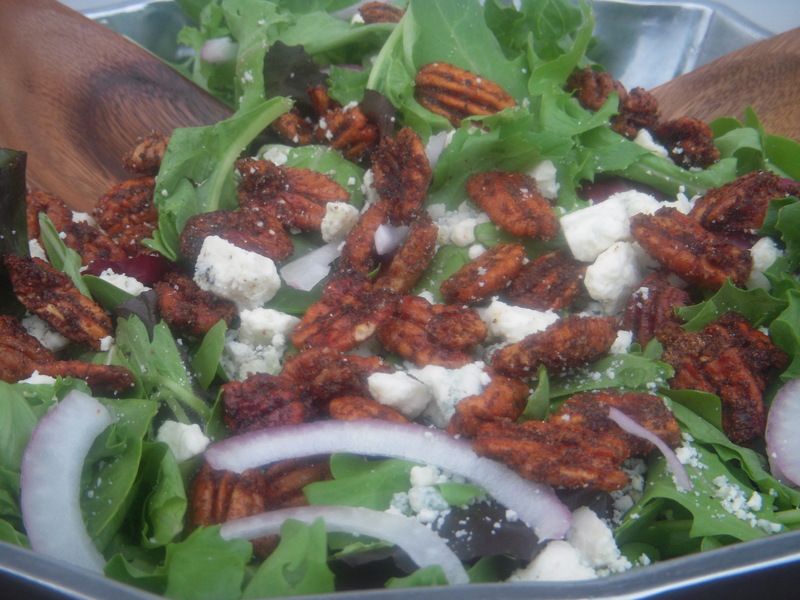 I love the combination of these pecans and blue cheese crumbles on a spring mix salad with balsamic vinegarette! Dissolve 1/4 cup of sugar in 1 cup of warm water. Let sit for 10 minutes. Drain pecans and discard liquid. Mix pecans with 2 T. sugar and 1 T. chili powder. Toss to coat. Lay pecans in a single layer on baking sheet and bake at 350 for 10 minutes, flipping after 5 minutes. Try them in a salad with spring mix, blue chesse crumbles, red onion, and balsamic vinegarette. So easy and so good! !